Twisted Pair is a collaboration between two poets. It is an act of language where poetry bends back on itself. The name comes from the public language of Network Technology. In particular it refers to a cabling technique in which a pair of twisted wires cancels out external electromagnetic interference. The term also implies the Double Helix, the structure of DNA which allows crossover and mutation in evolution. This is most certainly what happens in the poetry contained in this collection. Last but not least, Twisted Pair refers to the poets themselves, for we are certainly a pair of twisted poets. Our first act of collaboration was for a project curated by Wanda Schubmehl which paired visual artists with poets to produce a work. The two of us were torn because we were each poets and visual artists. We decided to embark on a long project in which each month we would each produce a postcard. The first month David would decorate his postcard with a visual work of art, while Donna wrote a poem on hers. Once these cards were received, Donna would respond to David's art with a poem, while David responded to Donna's poem with visual art, then we would respond the other way, rinse and repeat. Each poem referred to the other artist's previous visual work and each visual work referred to the other poet's previous poem. Together the set created a double helix, a recombinant structure. In the end we were pleased with the work but more importantly we were sold on the idea of collaborating as a mechanism for creating. In Twisted Pair, our second act of collaboration, we asked ourselves some questions. What is the act of authorship? In the age of We The Media, The Blogoshere, and The Creative Commons, was Barthes correct in declaring "The Death Of The Author?" Was Foucault correct in asking "What is an Author?" Our first impulse was to scream NOOOoooo. We decided to investigate and take it up a notch. Rather than each collaborator creating individual works that had intertextual reference to the other collaborator we decided to blur the lines a bit more. Strongly influenced by Ted Kooser and Jim Harrison's book Braided Creek, we decided to collaborate on each poem in such a manner that no single author could be attached to any poem. However this brought up some logistical issues as to how we might co-edit at the word level rather than at the level of the work. We decided to leverage the explosion of Social Software available for free on the internet. We created a private Wiki for free at WetPaint (a wiki hosting site). Now you might ask as Donna originally asked when David mentioned a Wiki "What's a Wiki?" (reminding David of Tigger when he asked Winnie The Pooh "What's a Pooh?"). A Wiki is an online collaborative environment for collecting and merging content from multiple people. In short, it is a tool that lets us edit the same web page (or collection of pages). The let us co-write/co-edit a collection of poems quickly (no waiting for the US mail), and it made working together at the level of a stanza or even at the level of a word, incredibly easy. We quickly found ourselves correcting each others spelling and punctuation (ok it was Donna correcting David), changing individual word choices, cutting, pasting, and splicing all on a daily basis. So, what holds? Is the Author dead in the age of hyper connectivity? In a word, no! Or rather Hell No! However the boundary of the author has become fuzzy. We found ourselves sitting in a coffee shop one evening, trying to title the poems in the collection. This forced us to read each poem scanning for key words etc. On multiple occasions we said things on the order of "I don't remember writing that line." And in fact neither of us had. It was only the combination of the two authors that wrote the line. Often a line had a totally different sense than either of us intended initially. At other times there were situations where one of us played with the sound structures of the other, in such a way that the meaning structure of the poem changed radically from one stanza to the next while maintaining an aural integrity. For example, in the following two stanzas, the second follows the "tin rims the can" of the first stanza with "thin stint the men." A totally different meaning from that intended by the first author. However, in a post-postmodern world where meanings are created more by the reader than the author, being surprised by the results of multiple authorship may be like considering the impact of the internet on the buggy whip. All in all, the use of a wiki resulted in easing the effort in creating a multiply authored work. We have been able to work effectively and create a work that neither of us could have done alone. If we could have, it would not have been as much fun. However on the one hand we have The Social, and on the other we have The Ego. And it may be this tension that will rule the day in the world of poetry. It is hard enough to reduce one's ego in the face of creating a work with another. If the team is, like us, a great friendship, then it will survive the creative onslaught. Phew! But then lift your head and ask "Who Owns The Work?" Suddenly there is nothing but three corpses. The two authors, and the work, trampled under the boot heals of lawyers. Let this day not come. Five crows circle between street trees. that sprawls across a squinting sun. Slow rotation of the turkey vulture. to prism sunlight and something more. The stream curves past the Shag Bark tree. a whispered hint to the delicate ear. The way is never straight or safe. and twisted rivers find the sea. 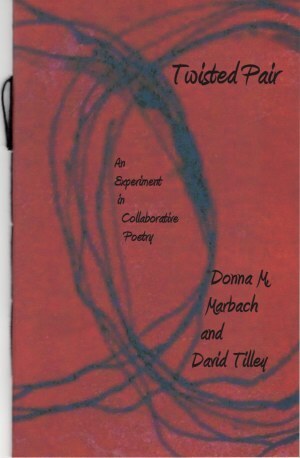 Both a visual artist and a poet, Donna M. Marbach has published non-fiction, fiction, and poetry in a variety of anthologies and periodicals. She has previously been the poetry editor of the national writers' magazine, By-Line and has also edited for FootHills Press. She is a co-founder and past president of Just Poets Inc. a not-for-profit organization dedicated to the celebration of poetry and poets. (www.justpoets.org). Her poetry has appeared in both print and on-line journals including Blueline, Hazmat Review, Homestead Review, Quercus Review, Sea Stories, The MacGuffin, The Red WheelBarrow, Silk Road,The Tipton Poetry Review, Limestone, Willow Swept Review, Halfway Down The Stairs, Breadcrumb scabs, The Southern California Review, The Chaffey Review and more. In February of 2008, she was the featured poet in the on-line journal. The Centrifugal Eye. Donna's small press Palettes & Quills has recently released Remembering Faces, the third chapbook in a series on Women Celebrating Women; When She's Asked to Think of Colors, a prize-winning chapbook by Katharyn Howd Machan, and Cinquainicity a series of linked cinquains written by 28 Rochester area poets in honor of Adelaide Crapsey. Donna's paintings have been seen on display at the Rochester Memorial Art Gallery's Clothes Line Art Festival,the Write Bookstore and Gift Shop in Honeoye Falls, at the High Falls Gallery in downtown Rochester, and among various exhibits of the Penfield Art Association. David Tilley is a writer and visual artist inspired by inner and outer landscapes. Traditionally his writing has been the poetry of place and meditation. More recently he has been driven by questions related to the reader as the bringer of meaning to the poetic work and the part played by juxtaposition and repetition in the creation and invention of new meaning. He has, over the last few years been experimenting with various forms of multiple authorship and has developed a strong belief in working at the level of the sentence. David has been published in Rag & Bone, HazMat Review, The Golden Lantern, World Haiku Review, Contemporary Haibun Online, and Modern Haiku.